BACKGROUND AND PURPOSE: In children, MR imaging abnormalities consistent with leukoencephalopathy after treatment for hematologic malignancy do not correlate with neurologic dysfunction and are often overinterpreted with regard to clinical significance. We hypothesized that this would also be true in primary CNS lymphoma (PCNSL) patients who attained a complete response (CR) after treatment with chemotherapy and osmotic blood-brain barrier disruption (BBBD). We hypothesized that cognitive function loss measured after tissue diagnosis but before BBBD-enhanced chemotherapy could be correlated with brain changes visualized by imaging, whereas a correlation would not be present after therapy if the patient attained a complete tumor response, analogous to the findings in children. METHODS: Sixteen primary CNS lymphoma patients were followed after CR (no enhancing tumor) by using a methotrexate-based regimen. Neuropsychological (NP) cognitive testing and MR imaging or CT (when MR imaging was not available) were performed before treatment and at completion of the 12-month treatment for each patient. Thereafter, the same studies were available for nine of these 16 CR patients, who were followed for a median of 55 months. Zone I was defined as enhancing tumor, and zone II as surrounding abnormal MR T2 signal intensity or low-attenuation CT. The cognitive scores were converted to Z scores and the MR T2 signal intensity or CT low-attenuated changes were converted to a summary zone II abnormality score. RESULTS: A significant association between neurocognitive data and zone II abnormality was found at baseline after tissue diagnosis but before chemotherapy (r = −.55; P < .028), but no correlation existed at end of treatment. Imaging studies showed that seven patients developed a new T2 or low-attenuation abnormality by the end of treatment, whereas 15 patients showed a decrease, stable appearance, or complete resolution of their baseline zone II abnormality by end of treatment. Although cognitive loss compared with age-matched control subjects was common before starting therapy, by the end of treatment all patients’ cognitive function improved significantly (P < .005). CONCLUSION: The current data suggest that neither enhanced chemotherapy delivery nor changes in MR imaging T2 signal intensity or CT low attenuation, in PCNSL patients who attained a CR, were associated with a decrease in cognitive function. Treatment of brain tumors can result in neurotoxic brain damage as determined by imaging modalities (1–4) or neuropsychological testing (5–12). Studies comparing imaging changes and cognitive function in adult brain tumor patients over a prolonged period of survival have been limited (13, 14). Such analysis is especially important for neoplasms such as primary central nervous system lymphoma (PCNSL) in which long-term survival is now possible (8, 15–18). A recent international consensus conference on PCNSL emphasized the importance of assessment of neurotoxicity to the CNS (19). 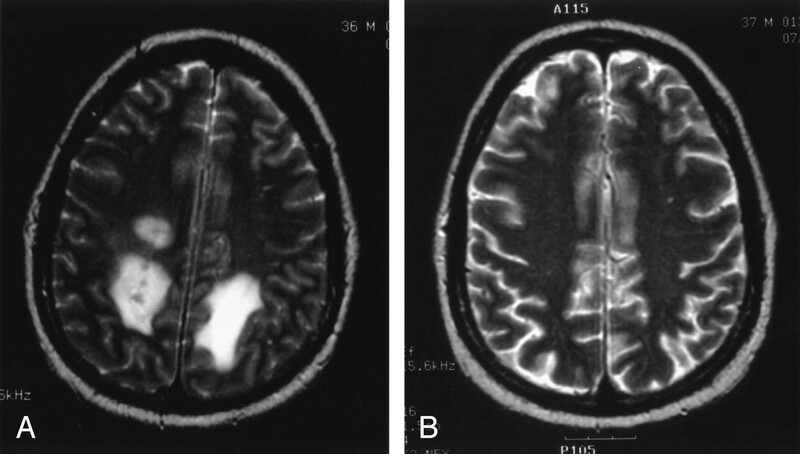 PCNSL patients who received methotrexate (MTX)-based chemotherapy with blood-brain barrier disruption (BBBD) have been the focus of an evaluative protocol in which their cognitive functioning has been assessed after tissue diagnosis but before treatment, at the completion of treatment (i.e., 12 months), and thereafter when possible (16, 18, 20). A recent study documented a cohort of patients who achieved a complete response (CR) without radiation therapy and demonstrated intact or improved cognitive function from their baseline assessments (i.e., after tissue diagnosis but before initiation of treatment) (9). Imaging changes in these PCNSL patients, however, were not evaluated. The present study compliments the previous work and attempts to compare cognitive outcomes, which may be a measure of quality of life, in 16 patients over a 20-year period in whom both serial neuropsychological (i.e., neurocognitive) testing and imaging studies were available. Patients were at least 1-year CR survivors, and some were long-term survivors of PCNSL. This study attempts to further brain tumor outcome research by examining possible treatment-related brain changes due to BBBD chemotherapy. Imaging studies are then compared with neurocognitive functioning as assessed by standard, age-adjusted, neuropsychological tests. Our hypothesis being that imaging abnormalities and cognitive function loss correlate after tissue diagnosis but before chemotherapy when tumor is still present, whereas if a CR is obtained, residual imaging changes will no longer correlate with formal cognitive testing. Bleyer (21) reported a similar study in children with hematopoetic malignancy. 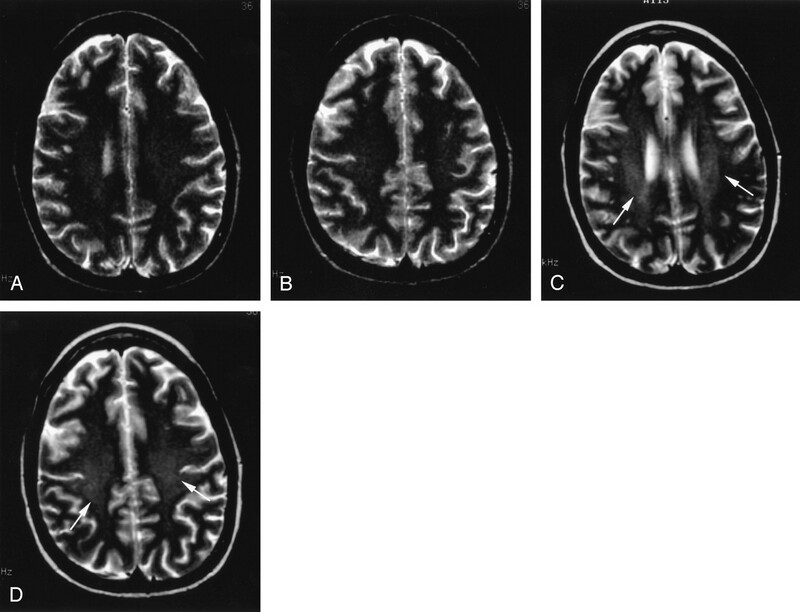 He observed that MR imaging abnormalities consistent with leukoencephalopathy were frequently observed in these children; however, most of these changes were not associated with detectable neurologic dysfunction. Indeed, he concluded that these imaging changes were frequently over interpreted with regard to clinical significance. Our hypothesis, as stated above, was that this was also true in our adult PCNSL patients who attained a CR after treatment with enhanced chemotherapy delivery. All patients entering a treatment protocol with BBBD for PCNSL signed an informed consent form approved by the university institutional review board. The BBBD chemotherapy protocol and procedures have been defined in previous works (9, 22) and have been shown to be safe and effective in multiple institutions (23). In brief, patients underwent two BBBD procedures, separated by 24 hours. Treatments were administered every 4 weeks, for 12 cycles (i.e., for about a year). Under general endotracheal anesthesia, patients underwent transfemoral catheterization of either the right or left internal carotid or one of the vertebral arteries. A test intraarterial (IA) injection was performed with iodinated contrast material to define the optimal mannitol infusion rate. Warmed 25% mannitol was then infused at the established rate for 30 seconds to disrupt the BBB osmotically. Then MTX IA and etoposide phosphate IA or intravenous (IV) was injected. Cyclophosphamide was also IV administered at the time of induction of general anesthesia. The arteries chosen for initial treatment were those with the greatest, radiographically identified, tumor burden. Patients then received rotating treatment of all three vascular territories. Sixteen patients were included in the final analysis (four men and 12 women), with a mean age at the time of their baseline assessments (i.e., pretreatment) of 47.7 years and a median age of 47 years (range, 10–68 years). These patients had an overall median survival time of 66.5 months from the time of their initial diagnosis. Of these 16 subjects, nine had complete neuropsychological testing and an available imaging study for comparison at least 2 years post-diagnosis. This long-term cohort of nine patients with median survival time of 55 months was assessed (by cognitive and imaging studies) at an average of 3.5 years from diagnosis. Neuropsychological testing included the Wechsler adult intelligence scale—revised (24), Wechsler memory scale—revised (25), Rey complex figure test (26), trail-making test (27), California verbal learning test (CVLT) (28), finger-tapping test, and hand dynamometer (29). For the one child included in the study, the Wechsler intelligence scale for children—III (30) was used, together with the wide-range assessment of memory and learning (31). With the exception of the CVLT, most patients completed the 10 tests as previously reported, both at baseline and the end of the therapy (9) when they had a CR. All neuropsychological data were reviewed and summarized by a licensed doctoral-level neuropsychologist (P.G.). Consistent with prior research, all test scores were converted to a Z score, which is a standardized score that can be used to compare different data sets and is adjusted for age. The Z score is the number of SDs above or below the mean for an appropriate normative population of subjects of similar age. A Z score has a mean of 0 and a SD of 1. Therefore a Z score change of 1 in either direction would indicate a significant change. For each patient, a summary measure of cognitive function, a “summary Z score,” was generated, which was the average Z score from tests administered at all assessment times (20). Because of the nature of testing medical patients in a hospital setting, time and access to the patient was limited, and not every patient received the entire battery for each assessment. In a recent article (10), the same issue arose (i.e., not all participants were administered all the tests at each assessment point [because of age or time constraints] and the number of patients assessed with each measure varied across time). In our study, for more correct comparison, the summary Z score for each patient was conservatively determined by using only measures that had been included on each assessment, so as to not skew a patient’s overall score or the interpretation of the data. This more conservative approach, making comparisons at all end points, was done by using the same tests to ensure consistency and accuracy of changes. Previous examination of this data set for individual patients has indicated that no single Z score from an individual test has been masked by the summary Z score (9). A decline in cognitive functioning has been established as a 1 SD in an individual’s post-treatment summary Z score, compared with his or her baseline assessment. Imaging analysis included MR and CT images as shown in Tables 1 and 2. After neuroradiologic review, all images were reviewed a second time by a single neuroradiologist (P.V.). Most of the patients had MR imaging at both baseline and end of treatment (n = 10); however, a few patients had different imaging modalities because of lack of MR imaging availability in early patients (as long as 20 years ago) or images were unavailable, which was a limitation of the study. Current analogous reports published in 2004 have also had to assess different imaging modalities (i.e., CT and MR imaging) (11). Axial MR images or CT images were evaluated for white matter abnormality. At baseline, gadolinium-enhanced spin-echo T1-weighted or post-contrast CT images were used to choose the axial section where the enhancing tumor had the largest diameter. At the same cutting plane, spin-echo T2-weighted MR images or the same post-contrast CT images were used to measure the largest diameter of the increased T2 signal intensity (MR imaging) or low-attenuation (CT imaging) abnormality around the enhancing central area of the tumor. Diameter measurements were carefully made by hand according to the measurement bar on each image. For both imaging methods, the enhancing central area was referred to as zone I, whereas the surrounding MR imaging T2 signal intensity or CT low-attenuation abnormality was called zone II. This is similar to the classification system used in previous studies (18, 32) and helps eliminate the misleading terms of tumor and edema (Fig 1). All other abnormal T2 signal intensity or low-attenuation areas separate from enhancement were also reviewed and their largest diameter measured. These areas were referred to as T2, or low-attenuation abnormality not associated with enhancing tumor. A, Baseline axial T1-weighted image, after left frontal craniotomy. There is heterogeneous increased T1 signal intensity, consistent with subacute blood due to biopsy, in the center of the left frontal parasagittal hypointense lesion (arrow). B, Baseline axial gadolinium-enhanced T1-weighted image. There is an intense enhancing mass (i.e., zone I) in the left frontal parasagittal region (arrow). C, Baseline axial T2-weighted image. The mass (arrowhead) is of relative low signal intensity, characteristic of PCNSL due to the high cellularity of the tumor. The central portion has high T2 signal intensity, which is consistent with subacute blood secondary to prior biopsy. The surrounding larger area of increased T2 signal intensity represents edema or infiltrating tumor and is referred to as zone II (arrows). At the end of treatment, the same plane as at baseline was chosen from the axial spin-echo T2-weighted or post-contrast CT images to measure the largest diameter of residual zone II (i.e., the T2 or low-attenuation abnormality), which was initially associated with the enhancing tumor. Similarly, the same planes, as at baseline, were used for the diameter measurement of the abnormal T2 or low-attenuation regions, which were initially not associated with enhancing tumor. The increase, decrease, or stable appearance of these areas was compared with the baseline diameters. In some cases, T2 or low-attenuation areas that were not present at baseline showed up by the end of treatment. These regions were referred to as completely new T2 or low-attenuation regions. A summary zone II abnormality score was calculated as the sum of the largest diameters of the zone II abnormality at baseline and the residual zone II abnormality at end of treatment. These were then compared with the summary Z scores of cognitive functioning. Measuring T2 abnormalities with a single diameter measurement is suboptimal; however, to perform volumetric assessments accurately requires 3D sequences, which we did not have. In the nine patients available for long-term follow-up, we compared the total T2 or low-attenuated abnormality the patient had at the end of treatment to follow-up imaging studies. New abnormalities were also searched for on the follow-up image. The imaging findings were again compared with the cognitive tests results. The baseline comparison of cognitive data and imaging study was done within an average of 12 days of each other, with a median of 5 days. The end of treatment comparison at 1 year between cognitive data and imaging study was done within an average of 60.5 days of each other, with a median time frame of 30 days. The average length of time between baseline and end of treatment neuropsychological testing points was 380 days, whereas the average length of time between baseline and end of treatment imaging studies was 352 days. The long-term follow-up cognitive data (i.e., third testing point) on the nine long-term survivors were collected at a mean of 37 months from baseline, with a range of 22 to 71 months. The mean time between the baseline imaging study and most recent image was 41.4 months for this group with a similar range. The mean time between follow-up cognitive testing and imaging study was 58.4 days. Data were analyzed by using descriptive and frequency statistics. This was followed by paired samples t tests and Pearson’s product moment correlation analysis. Analyses were conducted by using SPSSX software for Windows. A survivor has been defined as an individual who is in a CR at the completion of treatment, with no evidence of disease. Long-term survivors are those patients who have survived with a CR for at least 2 years. This study describes 16 1-year survivors (with a median survival time of 66.5 months) and nine long-term survivors (with a median survival time of 55 months). At baseline, nine patients had single- and seven patients had multiple-enhancing lesions. Most enhancing areas were located in the periventricular frontal, parietal, and temporal white matter as well as the splenium of the corpus callosum. Comparison of zone II at baseline and the residual zone II at end of treatment showed that 15 of the 16 patients demonstrated stable, decreased, or complete resolution of this abnormality (Table 1; Figs 2 and 3). Of 34 zone II lesions, five showed no change, 18 were smaller, and 10 were resolved. For each patient, complete resolution was indicated (Table 1) only when all zone II abnormal areas resolved. One zone II lesion increased slightly. A, Baseline axial T2-weighted image demonstrates large zone II areas in the bilateral parietal periventricular white matter (arrows). The heterogeneous low signal intensity areas directly adjacent to the posterior aspect of the ventricles represent the solid tumor mass (arrowheads). B, End-of-treatment axial T2-weighted image shows only small, residual zone II in the bilateral parietal periventricular white matter (arrows). A, Baseline axial T2-weighted image shows three distinct areas of zone II in the centrum semiovale on both sides. B, End-of-treatment axial T2-weighted image. No T2 signal intensity abnormality is seen (i.e., the zone II areas have completely resolved). Eight of the 16 patients had T2 signal intensity or low-attenuation abnormality that was not associated with the enhancing area at baseline. Two of these eight patients had no change, two showed a decrease, and four showed an increase of this type of abnormality by the end of treatment (Table 1; Fig 4). A 61-year-old woman with PCNSL (patient 12 in Table 1). Change of T2 signal intensity abnormality that was not associated with enhancing tumor at baseline. Baseline Z score −.46; end of treatment Z score −.26. A, Baseline axial T2-weighted image demonstrates linear as well as tiny ovoid areas of T2 signal intensity abnormality bilaterally in the parietal periventricular white matter (arrows). This may represent small areas of chronic small vessel ischemic changes and probably enlarged Virchow-Robin spaces. Also note a large left frontal zone II abnormality (arrowhead). B, End-of-treatment axial T2-weighted image shows enlarged and more intensive T2 signal intensity abnormality bilaterally in the parietal periventricular white matter (arrows). This may either represent aging with advanced ischemic changes but more likely represents changes secondary to chemotherapy, which is supported by the fact that multiple, new, partially confluent T2 foci appeared bilaterally in the periventricular white matter (curved arrows). Note the much smaller left frontal residual zone II abnormality (arrowhead). By the end of treatment, completely new T2 signal intensity or low-attenuation abnormality could be observed in seven of the 16 patients. These included diffuse bilateral periventricular and centrum semiovale, focal periventricular and centrum semiovale, and tiny areas in the basal ganglia, brain stem, and cerebellum (Table 1; Fig 5). A 36-year-old woman with PCNSL (patient 4 in Table 1). Appearance of new T2 signal intensity abnormality. Baseline Z score −2.03; end-of-treatment Z score −.79. 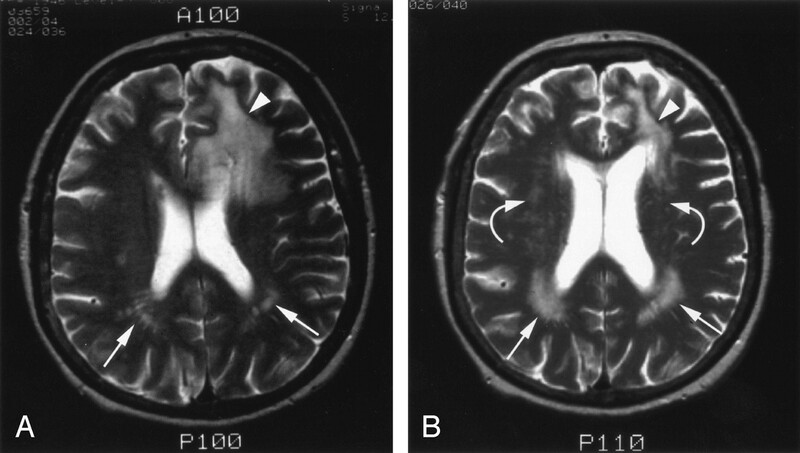 A, B, Baseline axial T2-weighted images demonstrate no signal intensity abnormality in the periventricular white matter and centrum semiovale. 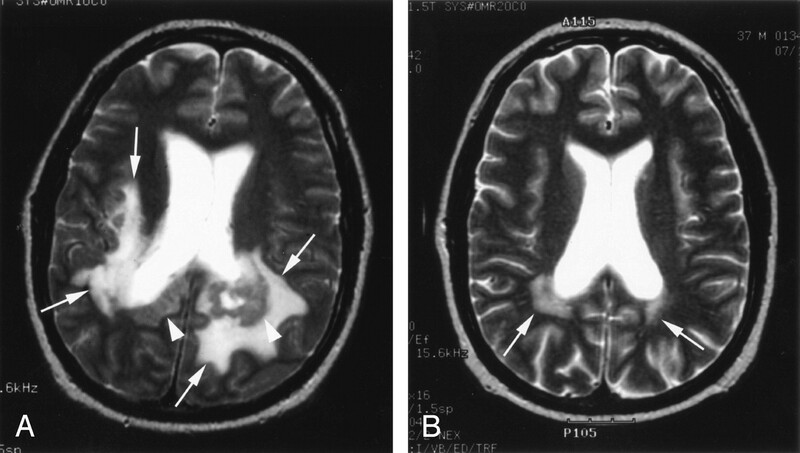 C, D, End-of-treatment axial T2-weighted images show diffuse high signal intensity in the periventricular white matter and centrum semiovale bilaterally (arrows). Of the nine patients for whom long-term (>2 years) follow-up images were available, six patients demonstrated no change in their total T2 signal intensity or low-attenuation abnormality. Only two patients showed new T2 or low-attenuation abnormalities (one of them had a focal right cerebellar lesion and the other developed a diffuse centrum semiovale plus focal parietal periventricular abnormality). One patient showed even further decrease of a residual zone II abnormality (Table 2). No patient had a significant decline in his or her individual neuropsychological Z score, which was masked by the average summary (see McAllister et al’s  Fig 3 and Table 4, for details on individual tests for this patient cohort). Thus, the focus of data analysis was on the summary Z score, a global measure of cognitive functioning (20). At baseline, the patients (n = 16) had an average cognitive Z score within the low average to borderline range (mean Z score = −1.1; SD = 1.1). After completion of BBBD treatment, patients had significantly improved cognitive functioning (mean Z-score = −0.35, SD = 0.52). Paired samples t test indicated that patients did indeed have a significant change in their summary Z score from baseline to the end of treatment (P < .005). The long-term survivors (n = 9) had a non-significant change in their neuropsychological Z scores at follow up assessment compared with end of treatment. A mean summary Z-score change of 0.16 occurred between end of treatment and follow-up assessments. The range of change in summary Z scores from end of treatment to last assessment was from −0.37 to +0.71 (Table 2). Only one patient had a negative directional change in their summary Z score, but this was not a significant change. The neuropsychological and imaging data were examined through correlation analysis. There was a significant association with a low neuropsychological Z score (suggesting cognitive problems), and large zone II abnormality at baseline before chemotherapy (r = −0.55; P < .028). At the end of treatment, however, there was no correlation with cognitive scores and residual zone II abnormality (r = −0.045; P < .868), suggesting that cognitive loss at baseline was due to enhancing tumor. Evaluating the effects on brain of different kinds of brain tumor treatments is crucial. If a treatment is effective in killing a tumor but damages normal anatomy as assessed by imaging studies or results in severe cognitive decline, the treatment has a questionable benefit as a therapeutic technique. Thus, a study that evaluates simultaneously imaging and cognitive changes as a response to a given treatment is beneficial. Our study assesses imaging changes and cognitive outcomes pre- and post-BBBD chemotherapy in non-AIDS PCNSL patients in both the short and long term. Neurotoxicity, as determined by imaging (1–4) and/or cognitive changes (5–9), has been associated with chemotherapy, radiation therapy (RT), and the combination thereof for treatment of brain tumors (33–37). White matter changes have been linked to RT in adults (35), and it is possible that white matter changes in children are implicated in non-dominant hemispheric neuropsychological decline after RT or RT plus MTX (38–42). Although it is difficult to make direct comparisons between different treatments applied to different tumors, current findings support previous results, which indicate chemotherapy for brain tumors does not result in a consistent pattern of cognitive decline (38). These findings lend credence that in our adult cohort it is not an odd or unusual finding that improved or intact cognitive functioning after high-dose, enhanced MTX is possible, even with the observed treatment-related imaging changes. Cognitive testing is recommended as part of standard protocols (6, 7), and it has been suggested that cognitive function is a relatively sensitive measure of brain function and can sometimes predict recurrence of disease even before anatomic changes are evident on images (13). In this study, low cognitive testing scores were associated with zone II (abnormal signal intensity around enhancing tumor) abnormality at baseline (after diagnosis and before chemotherapy), but the residual zone II abnormality at end of treatment was not associated with lowered cognitive scores. Some imaging changes, presumably treatment effects, were observed, but with no associated cognitive decrement. Residual zone II abnormality and even new T2 MR imaging or CT low-attenuation abnormalities were not associated with any cognitive decline. In fact, at the end of a year, most patients had improved their cognitive test scores. The long-term follow-up data suggest that survivors more than 2 years after diagnosis continue to show stability or improved cognitive function—in contrast to the effect of radiation therapy on neurocognitive function, which causes deficits that are relatively slow to emerge and manifest progressively over time (10, 12). Imaging changes that are not tumor related do not appear to be associated with cognitive decline. Other treatment options for PCNSL, including radiation, have shown considerable cognitive loss over time (8, 11, 12, 17). Unlike the current report, previous communications rarely have had baseline (after diagnosis but before the start of therapy) cognitive data (11, 12). Viable tumor extends beyond the enhancing tumor margin (43, 44); thus, zone II may represent not only edema, but also nonenhancing infiltrating tumor (32). Zone II areas significantly decreased from baseline to end of treatment in most of the cases. Although seven patients developed completely new T2 signal intensity or low-attenuation abnormalities, each demonstrated stable or improved cognitive function (Table 1). These imaging abnormalities were likely related to the chemotherapy and included diffuse or focal bilateral periventricular plus centrum semiovale abnormality or tiny focal areas in the basal ganglia, brain stem, and cerebellum. Residual zone II areas, which remained at the site of the tumor, and new abnormalities that developed by the end of treatment most likely represent a mixture of gliosis, demyelination, and increased tissue water content (36, 37). Even though MR imaging only was assessed whenever possible, with some patients we were limited to comparing different imaging modalities (i.e., CT with MR imaging or vice versa), which is a drawback of this study. Other current reports are also coping with the same limitation (11). Even so, the patients who attained a CR did not suffer cognitive decline, but rather improved or maintained cognitive functioning. Thus, the BBBD chemotherapy technique does not result in progressive parenchymal damage during the years after treatment, as is seen with RT (35–38). The abnormalities, which can develop by the end of BBBD chemotherapy treatment and remain without resolution during follow-up, do not appear to translate into cognitive impairment. Zone II, T2 (MR imaging) or low-attenuation (CT imaging), abnormality around enhancing tumor is associated with cognitive functioning at initial diagnosis, but residual zone II abnormalities are not related to cognitive decline after a CR is achieved through BBBD to enhance chemotherapy delivery. Even new T2 or low-attenuation abnormalities at end of treatment and after 2 years or more from diagnosis were not associated with cognitive decline. These patients had a median survival time of 55 months, have improved cognitive function compared with that at the time of diagnosis, and continue to remain stable. The initial cognitive improvement is assumed to be due to the effectiveness of BBBD to enhance chemotherapy delivery and efficacy. The sustained improvement in the long-term cohort speaks to the safety of BBBD treatment over time, in contrast to radiation therapy. The findings in this small series are positive indicators for the use and success of BBBD treatment but, because of the limitations noted, need to be interpreted cautiously. Supported by National Institutes of Health grants R01 NS44687, NS33618 and NS 34608 and by a Veterans Affairs merit review grant. Accepted after revision April 19, 2004.